A safety device which prevents drivers using mobile phones by automatically intercepting calls and text messages when they are moving has been unveiled. The software tells callers the person they are trying to reach is driving and asks them to leave a message. Canadian firm Aegis Mobility hopes its system will become available via a monthly subscription fee. 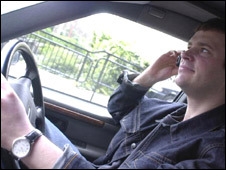 The Royal Society for the Prevention of Accidents (RoSPA) says drivers are four times as likely to crash using a phone. The DriveAssist system can also tell callers where the person they are trying to reach is located by using satellite navigation technology. Motorists using mobile phones caused 25 fatal, 64 serious and 259 slight accidents in 2007, according to the Department for Transport. It has been illegal to use a mobile phone while driving since December 2003 - with offenders facing a £60 on-the-spot fine and three points on their licence. A RoSPA spokesperson told BBC News: "Our advice to drivers is to switch off their mobile phones when they get behind the wheel and let voicemail do its job." Meanwhile, a survey by motoring group RAC shows almost half of drivers are seriously distracted by in-car technology - rising to 55% for 17-to-24-year-olds. The most distracting gadgets were radios and CDs, followed by mobile phones and satnav systems which each put off around a third of drivers. Heating and air conditioning controls distracted 35% in the survey of 1,034 motorists. Anti-locking brake systems (ABS) and immobilisers are fitted as standard on new cars, yet only 70% of drivers knew they had ABS and only 68% knew they had immobilisers. The Department for Transport says distractions account for 12% of all road accidents. In 2007 that amounted to 75 fatal, 411 serious and 2,517 slight accidents. • 23% believe drivers will be able to simply input an end destination then sit back and enjoy the ride. • 35% think cars will be able to "talk" to each other to pinpoint and avoid traffic. • 71% believe cars will be able to tell you when you are exceeding the speed limit with half predicting automatic prevention. • 60% predict fingerprint, voice or breath recognition will replace keys to start a car. RAC's technical director David Bizley said: "In-car technology has come a long way since the late 80s. The advances have fallen into two camps - active and passive. "Active technologies such as in-car entertainment are not always positive as they can cause driver distraction, while passive technologies, such as anti-locking brake systems (ABS), are undervalued as they are not fully understood or deemed less important as they come on automatically."